Lisa & Ryon are Fun In the Sun Weddings’ newest newlyweds! This bride and groom debated spending money on a wedding, not wanting to break the bank. 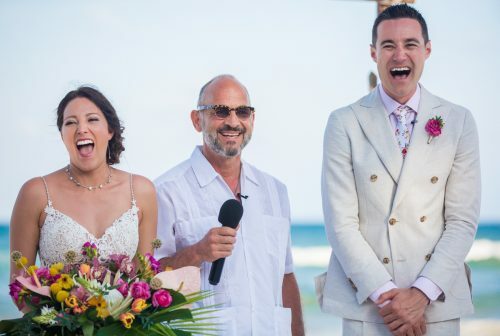 But after their Tulum wedding at the Ak’iin Beach Club completely exceeded their expectations, they say they would do it again in a heartbeat. Lisa and Ryon met in college and dated for eight years before deciding to make it official. Ryon included Lisa’s whole family in his proposal plan, creating a cover story of a family photo at the Colorado National Monument on Christmas Eve. Walking out to a beautiful view of her hometown, Ryon told her that the real reason for the trip was not for pictures, but rather for a question he wanted to ask her. Then he got down on one knee to joyful tears from all! They had been dating for a long time and seriously debated the practicality of spending a ton of money on a wedding. 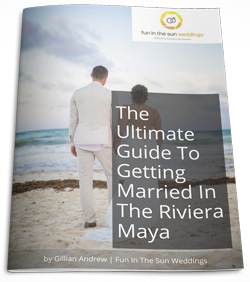 Ultimately, they decided they did want a special celebration and chose a destination wedding in Tulum. It seemed fair that if one of their families would need to travel for a wedding, then they should all just get a great vacation out of it! The bride and groom hired the incomparable Kristee Smith from Fresa Weddings as their wedding coordinator. She brought their vision of a ‘Tropical Paradise’ to life with vibrant colors, lush greenery, a driftwood arch, and accents of rose gold wherever they could be squeezed in. Vanessa Jaimes Floral Design created total magic, as is customary, with explosions of pink, orange and pops of purple. On her wedding day, Lisa was a stunner, with the glam squad at Beso Brides on the scene. She and Ryon opted for a First Look photoshoot, seeing each other before the ceremony, and the bride says that it was her favorite moment of the whole day. Seeing his smiles before the wedding calmed her nerves for the remainder of the night. Believe that everything will work out. It’s easy to get caught up in the stress and worry, in the end it all works out to be perfectly imperfect. Know it’s about you and your husband and just enjoy that moment. Lisa and Ryon, what a spectacular wedding! We are so honored to have captured this beautiful event and hope we will see you back our way very soon. Best wishes for this next chapter in your lives together. Congratulations! 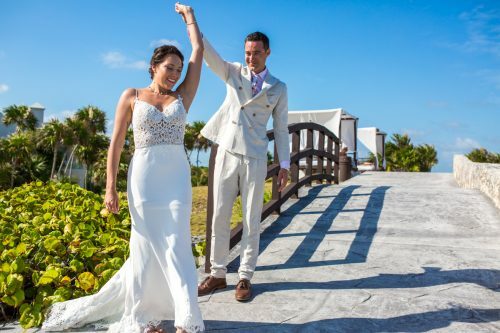 And if you are looking for the best wedding photographers in Tulum for your beach wedding, then contact us today! 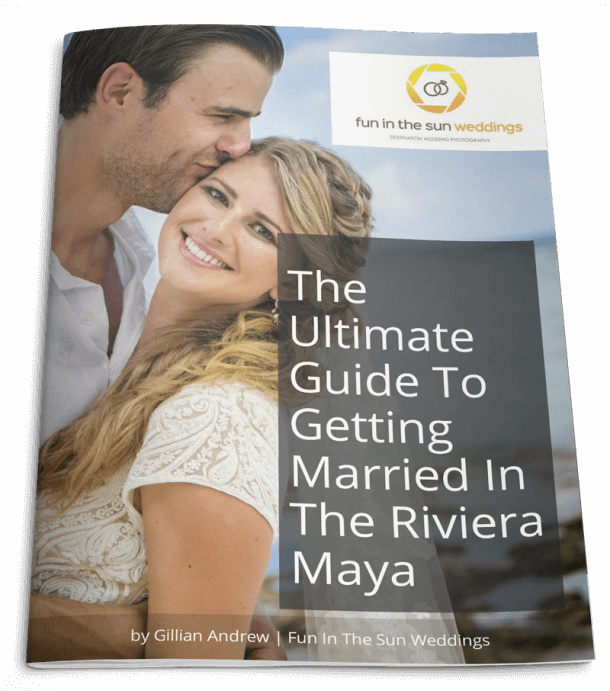 We are Fun In The Sun Weddings, the best photographers in Tulum, Mexico. Want to know more about the Ak’iin Beach Club? Read unbiased reviews on Tripadvisor here. Marc and his team are wonderful and made me feel comfortable the entire time. Our pictures are stunning!